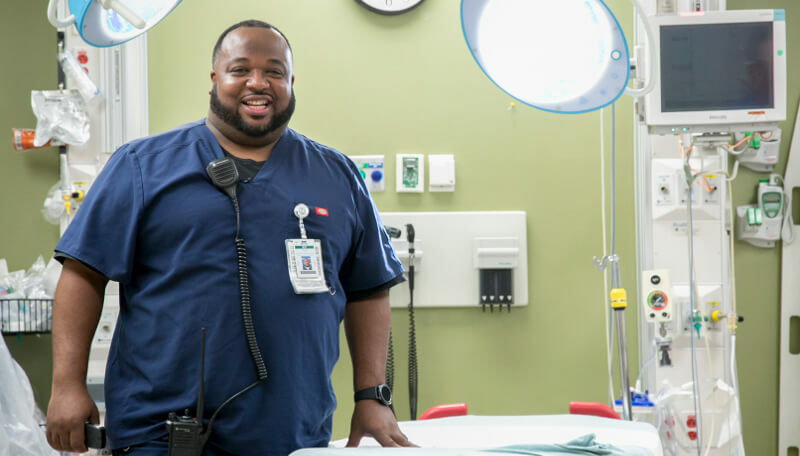 Felix McCoy’s career revolves around serving others. His first foray into service: three years of active duty in the army as a medic and then another two years in the National Guard. 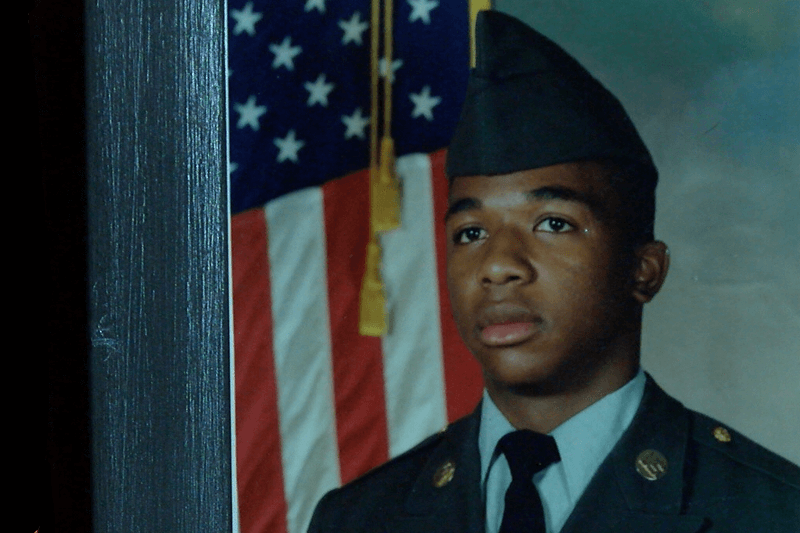 When he finished serving our country, he wanted that service to others to continue in the medical field. So he became an EMT, and then later went to nursing school. For McCoy, nursing runs in his blood. His mother is an ER nurse. Same for three of his cousins. 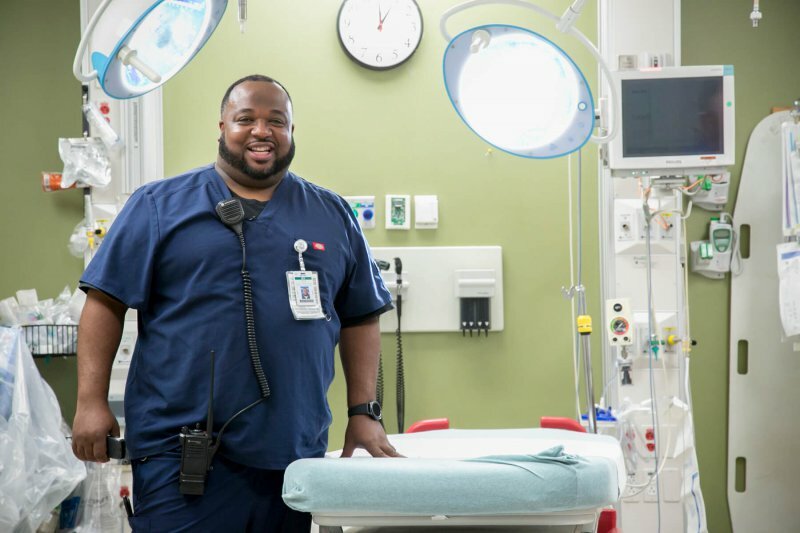 He started as a licensed vocational nurse (LVN) and then became a registered nurse (RN). 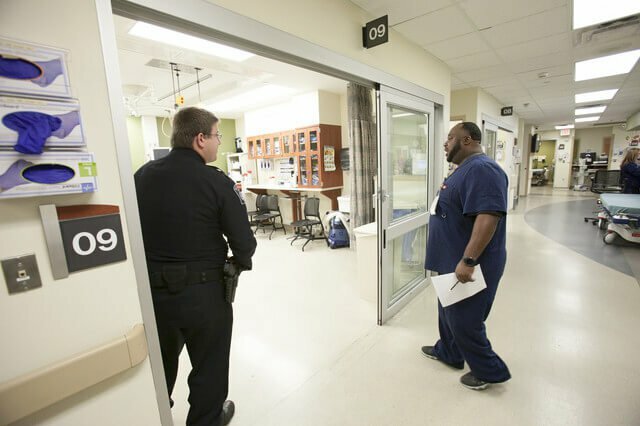 Before the recent move to the state-of-the-art Dell Ascension Seton Medical Center at The University of Texas, his entire 17-year career had been at University Medical Center Brackenridge. McCoy is a nurse supervisor. 5:06 a.m. McCoy’s day starts before the sun comes up – usually around 5 a.m. His three sons and wife are still asleep. 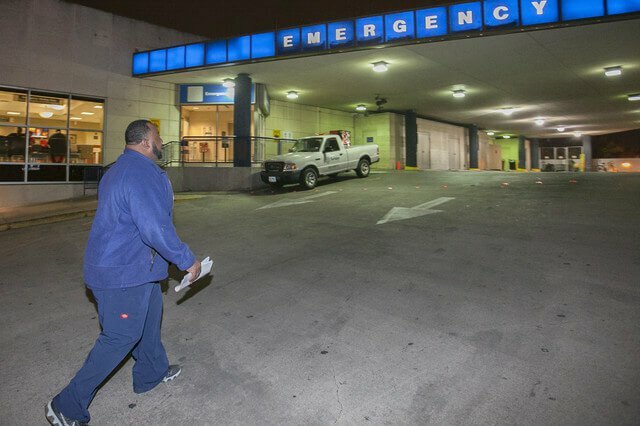 The only family member awake is Zeus, his nine-year-old pit bull, whom he walks loyally every morning before leaving for work at 5:30 a.m.
6:01 a.m. McCoy arrives at UMC Brackenridge, his ‘second home’ as he calls it. 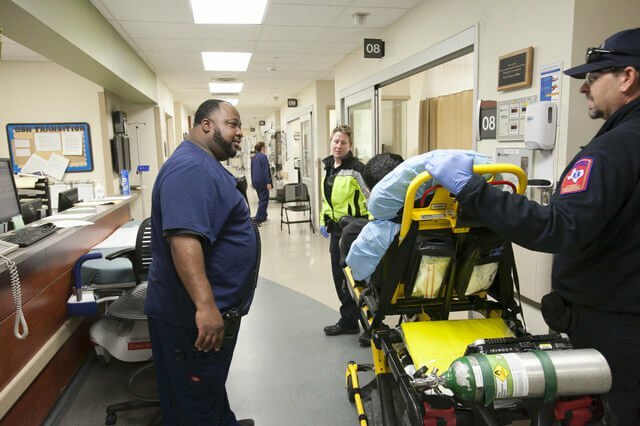 The non-stop activity, split-second decisions and life-saving treatments are just about to begin for him in the emergency department. 7:36 a.m. 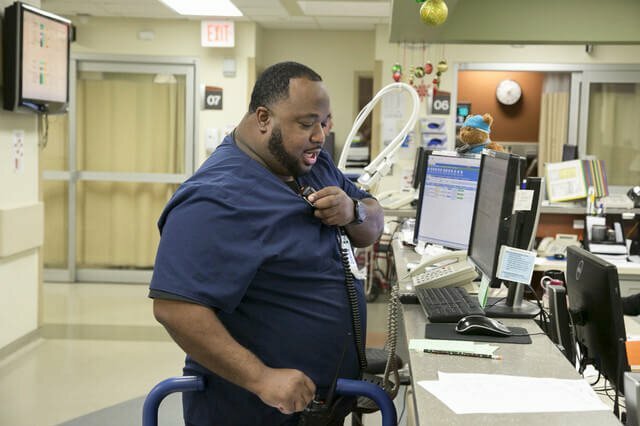 He is tethered to an encoder, the main communication lifeline from Emergency Medical Services (EMS) to Ascension Seton, for his entire 13-hour shift. A typical day: rounding, meetings, taking more than 100 EMS calls, triaging, bedside treatment, and supervising more than 30 staff. All of it with a smile on his face. 8:05 a.m. The morning starts off quiet. 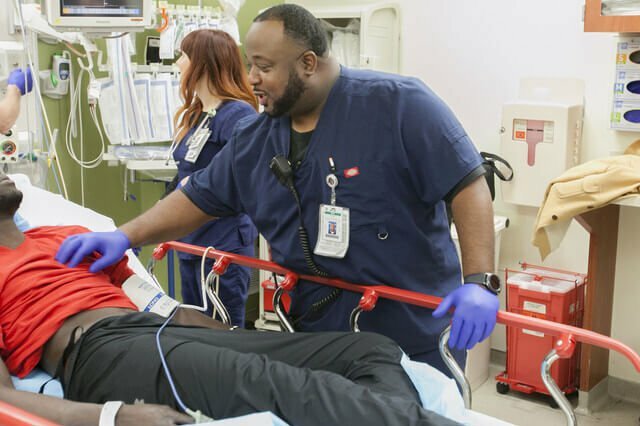 McCoy’s first patient arrives with chest pain. He has already assigned which team members will treat her, and where. 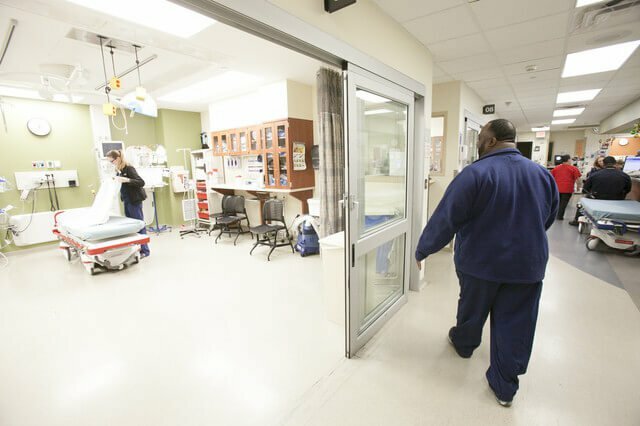 10:10 a.m. On a typical day, McCoy’s team sees a full array of conditions – anything from drowning accidents to construction injuries to anaphylactic shock. 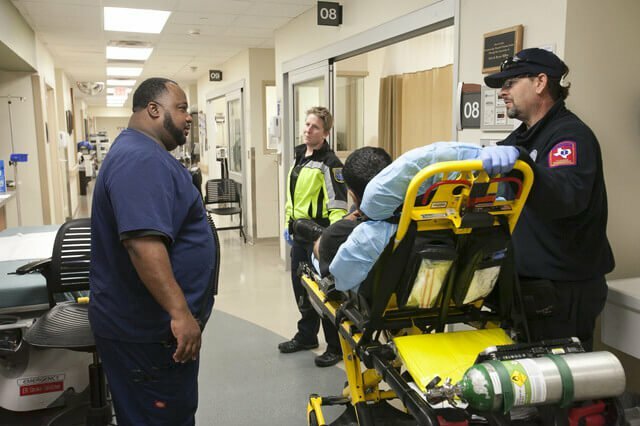 His team faces four to five major traumas on average for a 12-hour period. But on a rough day, it’s not unusual to encounter three or four traumas in under an hour. 1:33 p.m. Another patient arrives, combative and argumentative with McCoy and his team. But he treats this patient with the same dignity and respect as any other patient coming through the doors. His military experience helps him stay focused and calm. With poise and presence, McCoy prepares his troops to face any chaos that ground and air ambulance services bring their way. He joins four Ascension Seton trauma surgeons who also have military experience including Drs. Jayson Aydelotte, Carlos Brown, John Sabra and John Uecker.